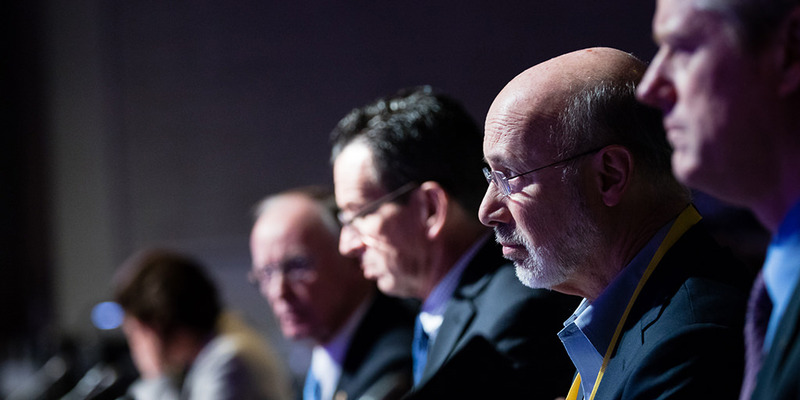 Harrisburg, PA – Governor Tom Wolf today joined his bipartisan colleagues from Ohio, Montana, Nevada, Colorado, Massachusetts and Louisiana to express concern over Washington’s approach on health care, particularly the prospect of deep cuts in federal funding to states for Medicaid. The letter also outlines guiding principles that the bipartisan governors believe should be the focus on the health care debate, including improving affordability, restoring stability to markets, providing state flexibility to encourage innovation, and improving the regulatory environment. To view the letter in its entirety, click here (Scribd). View a PDF version here. We believe that, first and foremost, Congress should focus on improving our nation’s private health insurance system. Improvements should be based on a set of guiding principles, included below, which include controlling costs and stabilizing the market, that will positively impact the coverage and care of millions of Americans, including many who are dealing with mental illness, chronic health problems, and drug addiction. Unfortunately, H.R. 1628, as passed by the House, does not meet these challenges. It calls into question coverage for the vulnerable and fails to provide the necessary resources to ensure that no one is left out, while shifting significant costs to the states. Medicaid provisions included in this bill are particularly problematic. Instead, we recommend Congress address factors we can all agree need fixing. Ensuring that quality health insurance is available and affordable for every American is a bipartisan responsibility. We believe there is common ground in driving down costs and stabilizing the marketplace. States have taken the lead in successfully implementing Medicaid and are uniquely positioned to help make our private health insurance sector vibrant, stable, and fair. Restore Stability to Insurance Markets: Americans without access to employer-sponsored coverage or government plans need to have access to a healthy, stable and competitive market of insurers from which to choose. Provide State Flexibility and Encourage Innovation: As laboratories of democracy, states can develop innovative approaches that have the potential to strengthen health insurance for all Americans. Within standards that protect the most vulnerable, states should have appropriate flexibility to implement reforms in a manner that is responsive to local and regional market conditions. Improve the Regulatory Environment: As the principal regulators of insurance, states are in the best position to promote competition within state insurance markets. Federal efforts should provide appropriate standards to protect consumers while limiting duplicative or burdensome regulations and providing relief to small business owners and individuals.